Simon Edwards was the last man standing at St Andrews on the first day of the Open as the final group came off to sign their cards in close to darkness. The seasoned Windermere pro shot a seven-over-par 79 at St Andrews in his first round at an Open Championship. 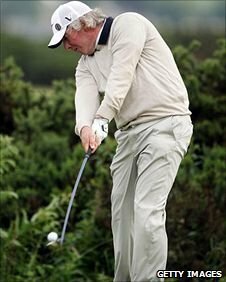 But despite taking all the elements the Old Course could throw at him, the 39-year-old Welshman remained cheery. "As an experience it was brilliant, one of the best I've ever had. But I was rubbish," Edwards told BBC Sport. Wrexham-born Edwards continued: "I wouldn't have missed it for the world, but the weather was hideous. "We got through the first six or seven holes then, round the turn, it was coming in sideways. But that's the luck of the draw. "In my world, I'm just happy to be here. I just have to remember that this is the Open, at St Andrews, and a lot of people will never do what I've done this afternoon." Edwards was only two over at the turn, but he dropped shots at 11, 12, 14, 15 and 17 to come home in 41 for his 79.